I loved your stuttering week last fall. Great resources and ideas. I love the units of study! Thanks for the inspiration! Whoo hoo! Congratulations on this incredible accomplishment! I’d love to go broke on laminating and ink by winning!!!! I love all the stuff that you have on your website. Such great ideas!! WOW, way to go, Jenna!! I like the social skills perspective-taking activities (i.e., Yellow Brick Road). Big thanks to you!! Contrats! 2 million is so exciting! I love the preschool book companions! I love your app reviews and language sets. Congrats, Jenna!!! Congrats on your great accomplishment! I love the book companions and your packets that go with Candyland. I appreciate most the book companions. Thank you so much and congratulations; you are a gifted slp. Congrats on 2,000,000!!! I like when you share what you did in therapy for the day. I have purchased some fun games and of course, LOVE the materials you make. Thank you! Congrats! I loved your 3 for me carryover idea. I played it with one of my artic kiddos and the next session he was asking for it again! I LOVE the Candyland cards. They are multi-functional and my kiddos always ask to play! I love all the book companions and theme sets!! Congrats! I have enjoyed all of your freebies in the past especially the pocket monsters. Congratulations! YOu were the first SLP blog I ever visited and you’re always the first one I visit every day! My favorites have been your book companions and your materials for social skills! You always have such good ideas!! What an amazing feeling that must be! Hoping you get to 3 million! Congrats Jenna!! I love all of your app reviews and book companions!! Congrats, Jenna! I don’t know how you do it all – you’re amazing. Thanks for sharing so many of your WONDERFUL ideas! I love your posts on classroom organization, reward systems, etc. 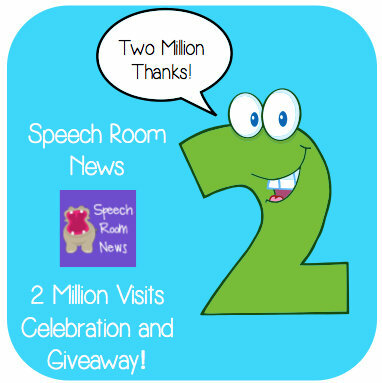 I’ll be a CFY in the schools next year & will need some help setting up MY speech room! That is amazing, keep the great materials coming! You’re wonderful! Thanks for all you do! I love checking out your blog site and seeing your organization. I bought one of those dollar store flower pinwheels and was thinking of using it for my artic kids as well having each color be a different requirement…whisper, baby voice, number of times, in a sentence, etc. Thanks for sharing all your great ideas! It is hard to pick a favorite, I appreciate all the app reviews and ideas. Really loved the Christmas catalog packet. Thank you for all the materials and ideas provided! I am loving all your packets that accompany books! It’s fun to see other ideas and new books! Thanks so much for all you’ve provided! I love your blog! It is my go to place whenever I need inspiration! I love all your book companion packets! Too many to chose from. If I had to pick something, it would have to be the angry bird ideas. I love all your book companions and your language packs! Thank you!! I love your book companions! They are so great and cover so many different areas that I can use it with most of my students! thanks! It’s hard to pick just one favorite, but BAZINGA, book companions, angry birds, Candyland and pirate theme are all in the running for #1. I love the Candy Land activities, as well as your ideas with Angry Birds! I love the CandyLand language and artic. And any of your book companions–they rock! Thanks for all of your ideas and resources! You are one of the reasons I am on TPT sharing my ideas and materials! Thanks! Love all of your stuff! I need that “Tops and Bottoms” companion pack!! I love all your book companions!! I think it’s awesome when you have one theme with several different packets that target different skills (artic, grammar, social, etc.) – people can pick what they need or get it all. The varying topics help so much for planning since one size does not fit all! I love when you compile a list of activities for a theme from different places. It helps me find new people and new products. i also love how your previews of products include so many details and examples from real-life use! Thanks for everything and contratulations!!! 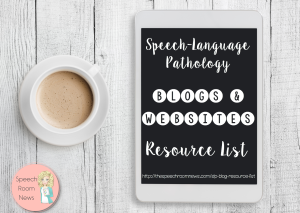 Yours is the first SLP blog I stumbled upon and it has led me to so many other wonderful SLP blogs. I have always said that I would love to sit on on some of my colleagues sessions as a way to get new ideas and the blogs/TpT have allowed me to do that without taking time away from my students. Thanks Jenna! Congrats!!! I love all of your book companions. The little guys love them and even some of my older students too! 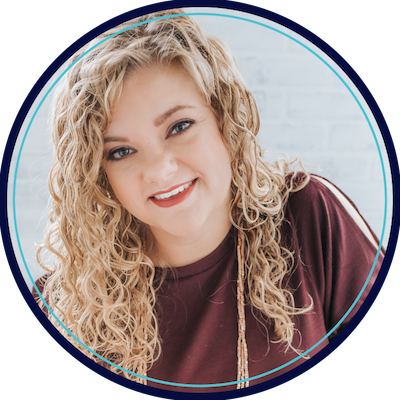 Love your blog, Jenna!! I check it nearly everyday! I absolutely love your preschool packs!! The CandyLand preschool packets were wonderful!! I would love to see more items like that!! I love your book companions as well!! Congrats on 2 million!! I love so many things that come from your blog/work, but I really loved when you put together the TPT list of SLPs. I found so many more SLPs to follow and find even more materials. Your book companions are amazing! Your pragmatics packets are really helpful too! How could I ever pick what my favorite is? I’ll just say that this week I’ve been using multisyllable gamballs and one of your book companion packs. Awesome! I love your preschool packs, they are engaging for the students and can be adapted for lower elementary as well! The CandyLand packets are my favorite – I think that was the first thing I ever bought on TpT! Congrats and keep up the awesome work!!! Just one…how about two (of many!) CandyLand – I think I have them all! and appreciate all of your app reviews – I am always hesitant to spend money on apps when I don’t know much about them – your reviews are always so thorough! I love all of your activities. Don;t know what i would do without TPT sometimes! I really enjoyed your posts about organizing your materials and speech room! Everything is awesome! This is my go-to blog for great materials! I enjoy the app reviews and the freebies. Everything you share with us is wonderful. Can’t thank you enough! so far, my most favorite thing has been the Yellow Brick Road social thinking packet. So creative! Congratulations! I love the seasonal activities…they give old skills a new twist! Congratulations! My most recent favorite was your apraxiaville review. I really love all of your app reviews! They are so insightful! Seriously, one favorite?! I don’t know that I can pick one thing . . . . I really appreciate all your hard work! Very hard to pick but LOVED the carryover idea you had with the tokens recently! Congrats! It’s so hard to choose what is my favorite as I have so many. I guess I’d go with the book companions. WOWWW !! That’s amazing!! Congrats- you’re an inspiration to all of us fellow SLP bloggers! I LOVE the book companions! So versatile, functional, and appropriate for my language groups from PreK-1st grade. The kids have loved them, too! I love your thematic things and social skills too. I like all the app reviews that you do. Its really hard to know which apps to buy without trying them first and this helps! I’ve about worn out my Candy Land cards they have been used so frequently. They have been a huge hit. I like all of the multi-use packets! They cover so many different skills! I love your old lady serie. Congrats Jenna on your 2 million views!!! Your blog is the FIRST blog I ever followed and still one of my favorites! Your posts, ideas, reviews and activity packs have made a tremendous impact on my therapy over the last year and a half! I also think I may have an SLP blog addiction since your tutorial post on Flipboard (one of my fave posts). What a great way to read blogs:) Thank you for all you do and congrats again!! Yippee! I just love your easy tips and tricks! You always have such great ideas about what can make life a little easier or more fun! Thank you for all you do for our field!!! Thank you for the ideas and activities. Love your creativity and energy! The Angry Birds Post was the first one of yours I saw and got me hooked! Congratulations! Your creativity, dedication, and commitment are obvious! Congrats! I appreciate every SLP in the online community! I crave the ideas and rely on the advice from all of you! I have been using your trick to save ink since I read it! Love Love your blog! I have been using your token/chip idea and explained it to include behavior not just artic and language carry over. 😀 BEST thing I ever did! Love your blog!! So much great information! Thank you! Congrats! I can’t pick just one, but two that come to mind right now are Candyland and Angry Birds posts. Thank you for all of your information and advice! Yay for you and your awesome blog! 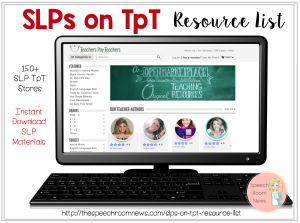 My favorite resource (this past week) has been your list of SLPs on TpT. I’m finishing my CF so I’ve been scouring your list to build up my activity arsenal! Actually I love the variety. Always something to think about. I have gotten so many fun ideas for therapy that it is hard to pick just one. I think one that my students love is the Bazinga game that I made. Personally I loved the directions for setting up and using Flipboard. It is an app that I use all the time now. It’s tough to choose which idea or activity I like the best! I like the holiday social skills, the ways to use gameboards in the classroom, angry birds, Phineas and Ferb inference and your encouragement! Congratulations on having 2 million page views! I know I’ve shared your blog with many of my coworkers! I really can’t name any one activity as a favorite. Depending on the time of year or theme of the moment, all of my activities from you have been valuable at some point. Thanks! I really appreciated your review of “Speech Buddies” – it helped me take the plunge! However, your blog is a daily inspiration. Keep up the good work!!!! I love the simple, CHEAP, craft ideas. I love all the candy land companions! I have them all!! Congrats! A geeky SLP laminating party sounds delightful! 🙂 I appreciate all that you do. My students (and future students) have benefited so much from your activities and tips. Congrats! My favorite are the book companions. Thank you for all that you do!!!! Hard to pick between book companions and app reviews! I love your book companions! Thanks for all of your hard work! Not only do you have great ideas for resources – I love your fonts, designs, and clip art choices 🙂 Thanks for all you do! I always enjoy the product reviews…. with limited budgets it’s nice to know exactly what I’m getting. I loved the carry over post with tokens that you recently had! It’s a different approach than the usual and makes them motivated to not only get the tokens but to keep the ones they have by continuously using good speech and language! Love this blog! Congrats!! My favorite post was your speech graffiti wall. The kids loved doing the activity and it was fun for the teachers to see what the kids were working on when they would visit my room! What a milestone…kudos to you! My favorite post was actually a guest post on evidence-based vocabulary instruction. I now use the LINCS strategy and have seen wonderful gains…thanks! I love your website! You have inspired me to become more creative in therapy! I am going to start making my own materials this summer! I love all your materials!! If I had to pick the ones I use the most, it would be your expressive language packets and candy land cards. Thanks for all you do.